I haven't noticed any problems, the smallest lipo I use during winter is 3S 2200. In this video did I use a 3S 2600 and after this flight did I fly the Tundra without the cam on it and was just ripping it around for just over 7 min and most of the time on full throttle inverted, rolls, straight up and stall turns and did still have a lot of power left. It may be that it doesn't get chilled as much when it's inside the fuselage and I do store them in my heated car and just takes them out when putting them in the plane and flies. They do generate some heat when being used, so in my case do they newer get really cold. Filmed when I and my son Marius had fun with our RC-sledge for a few weeks ago. At the moment can't we do anything because we still have almost 1m (3.2 feet) left with rotten snow and where there is no snow it's just mud. Now it will be very warm for two weeks, so hope all the snow will disappear and that it will dry up so we can start flying again. Reminds me of the winter olympics - the luge or skeleton except with motor noise! Nice one Bjarne. Hope the weather improves for you - we have at last got 21C deg +. We have had about 15C deg+ the last days so hopefully will the snow melt fast. The picture is from today taken from the live webcam from our local airfield, and as you can see is there still a lot of snow. After a long winter with extremely much snow and a lot of illness myself and in close family have I finally start flying again. There were some nerves on the first flight, but it quickly went over and flew several times without any crashes. 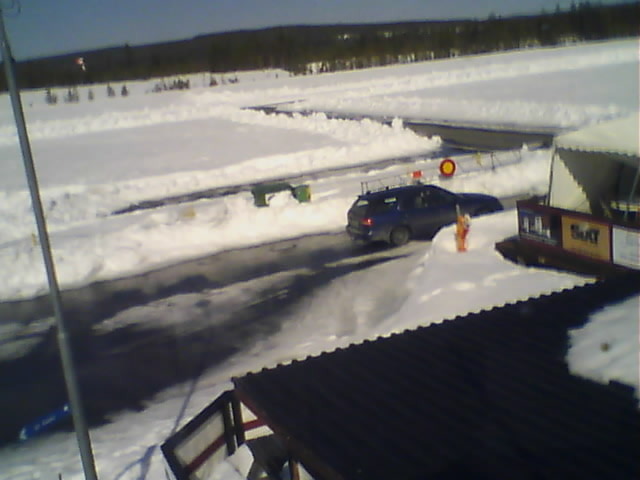 So a great day, I hope that the last little piles of snow will disappear and that everything will dry up quickly now. Well Done Bjarne, it's good to see you back out there flying. I have been flying today too, but eventually the wind got too fast, but it was a great day out anyway. Thank you Dwain, it's really good to be back, next week 10-13 may will we have a spring meeting so I'm hoping for excellent whether and a lot of flying. Nice one, Bjarne. Good to hear you are back in the "dark blue" , stick twiddling. Summer seems to be a long time coming. Thx Adrian, I have been doing som "upgrades" on my old Piper J-3 Cub today. My good old 4 stroke OS glow engine have gotten an onboard glow and a LiPo voltage indicator and is now ready to fly. Here is an older video of the over 20 years old model and still flying strong. Ah! a thing of beauty, very enjoyable. Have been asked more about a small tour of my hobby room, so here is a small video now that I have used the room for just over a year. Seeing that gives me a taste for venison for dinner. Did it you too Bjarne? I have purchased this amazing little model used, a small glider with a 180 cm wingspan and a small retractable EDF engine that comes up when giving throttle. This is my very first flight with this model in some hard winds, 5-6 ms with gusts up to double. A very nice Sebart Sukhoi 29 with 2.6m wingspan and with a really good pilot (Robert Wermelin) who flies this beauty. It's a pleasure to be a spectator and just enjoy the flight. Got this wonderful model from a good friend a little bit damaged two years ago. Has now repaired this and converted it from glow engine to electrical. This is the first test flight after conversion from glow to electric. The plane flew perfect, did not have to trim anything when the model flew completely straight. A fantastic plane that will have many flights this summer. This is a great plane that you can play and have fun with or you can be soaring a long time with some thermals. Small and lightweight model that fits beginners and advanced pilots. Filmed from the ground and onboard camera. Keep 'em coming Bjarne! Cracking runway you have there. A fantastic model of a Hawk Mk.66 piloted by Ole Martin Vuttudal Moe, the model is very big with a fuselage of over 3m and a wingspan of 2.5m. A good pilot that makes this show a wonderful experience that you never forget.